Save 20% on Rumparooz/Kangacare Diapers and Accessories! LABOR DAY SAVINGS from Rumparooz & Kangacare! Save BIG this weekend when you purchase ANY Rumparooz or Kangacare brand cloth diapers or accessories from Diaper Junction! Make sure to use code LABOR20 at checkout to receive the 20% discount. This discount cannot be combined with any other coupons or discount codes. 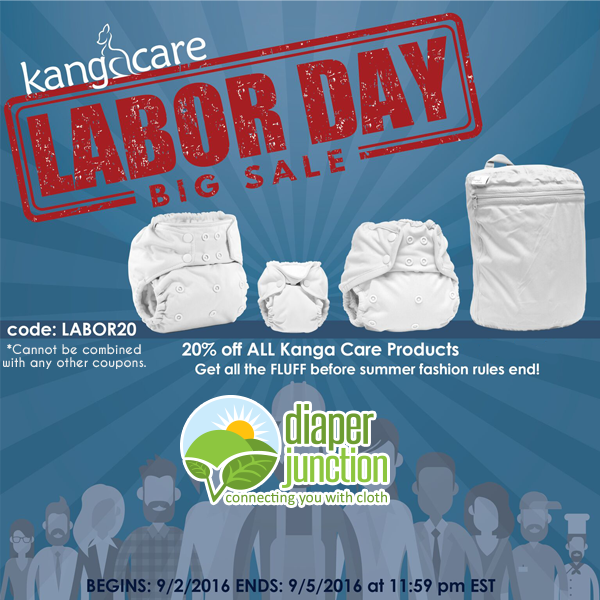 To get started shopping and take advantage of this Labor Day Cloth Diaper Sale please see our Rumparooz/Kangacare cloth diapers here. This sale is valid September 2nd through September 5th at 11:59pm EST.